Sometimes called a labor assistant, a doula is person who assists a woman in labor. In recent years, doulas have become more popular and widespread. Research and personal experience show that a doula can be an integral part of a woman’s birth team, not only during labor but before and after. emotional and physical support for a woman in labor. A doula does not replace medical personnel, such as a midwife or doctor, but supplements their care. A doula should be familiar with the various positions that a woman can assume to speed labor or help make her more comfortable. She may remind the family of the things that they have learned in their childbirth classes. A doula can also provide hands on, physical comfort measures such as massage and counter-pressure. Emotionally, a doula can also be an asset. As a woman familiar with labor or who may have experienced labor herself, she can recognize what words or affirmations can be helpful to a woman struggling in labor. 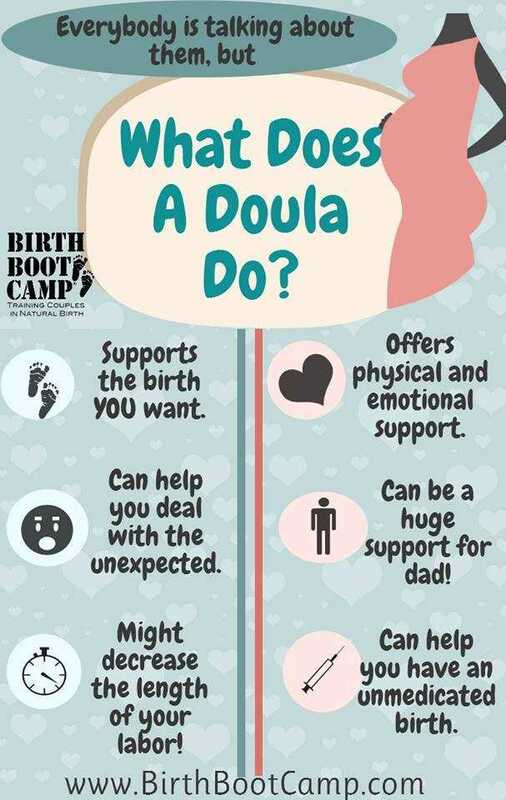 Since a doula typically has some training or at least experience being around birth, she can also recognize where a woman is in labor and be a knowledgeable comfort to the family, letting them know that they are close to the end or when they should head to their birth place. It is important to note that the doula doesn’t just benefit the mother, but can be incrediblyhelpful to her partner without replacing his important role. A woman’s partner knows her on a personal level and can help her in ways that nobody else can. He has, hopefully, taken birth classes with her and learned some of the basics of birth and labor. Sometimes, couples who prepare well together don’t feel the need for a doula, but they shouldn’t dismiss the idea altogether. During labor and birth, an extra pair of hands is almost always helpful. The doula can do hands on things and can comfort the mother, but she can also give dad a break when he needs a nap or a bathroom run. She can even help with food preparation or caring for other children, if that is what you specifically hire her to do. The presence of a warm, knowledgeable, and skilled doula is something that, very often, the PARTNER is more grateful for than the birthing mother! Several studies have found that the presence of a doula vastly improves the birth experience for the mother, lowers intervention rates (like cesarean section and Pitocin), and shortens labor. Not only did the presence of a doula decrease birth interventions, it seemed to drastically lower the rates of epidural use. For a woman planning a natural birth, a doula can be a fabulous investment. A small study, based in Sacramento, California, USA, found that doulas not only improved birth outcomes but increased breastfeeding success. The same study also found that the presence of a doula shortened the second stage of labor (when mom was pushing) and improved APGAR scores. Truly, a doula doesn’t just help mom, she is good for the baby too. How do you find a doula that is right for you? Start by simply talking to other people in your community. Friends, your childbirth educator, your midwife, and anybody else you may know who is familiar with doulas can be helpful in getting you started in the right direction. Check out this website to see if there is a professional doula in your area. These doulas have been through rigorous in-person training as well as academic reading and reports. Sometimes local birth networks, hospitals, or birth centers have â€œMeet the Doulaâ€ events where you can come and meet many local doulas and find one who works best for your family. The presence of a trained doula can have a measurably positive impact on birth outcome, lowering intervention rates, lowering cesarean section rates, improving infant APGAR scores, and even improving breastfeeding success. A doula can benefit the mother, her partner, and the baby and is often an investment the family is grateful they made.